Do you need ideas for new blog topics? Do you use social media to find them? Social media conversations can lead to topics that feed your blog. In this article I’ll share five ways you can use social media to find new blog topics your audience will love. Combining your social and blog efforts doesn’t have to be a one-way street. You can use them to play off of each other. After you publish blog content, promote it on each of your social media channels. Tweet out a link to new (and old!) blog posts and ask for your audience’s opinion on the topic. Or post it to a LinkedIn group and ask the members for their thoughts. 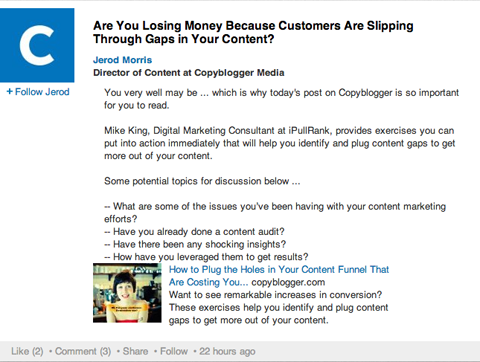 When Copyblogger publishes an article on their website, they also create a discussion on LinkedIn asking for opinions on the blog post. Their staff then checks in and engages with the commenters, asking for additional opinions or coming up with new questions to keep the conversation going. Keep the conversation moving forward to get ideas for new blog topics. This technique is particularly beneficial for reaching people who are not subscribed to your blog updates. Now they can see your content and join the conversation. How does this work for coming up with new blog topics to write about? The extended conversation can lead to new ideas you can use as-is or modify as needed. You could even make another blog post series if the conversation is really juicy. There are thousands, if not millions, of conversations going on constantly on social media. People are talking about what they did that day, current events, their jobs, etc. Inside all of these conversations are blog post ideas, right at your fingertips. To quickly find those kinds of conversations, turn to Twitter and look for trending topics related to your niche. Search for and follow Twitter hashtags that are relevant to your company, your local affiliations and town and engage with your community on various levels. I also suggest you participate in or host regular Twitter chats related to your niche or industry. Based on what people are saying during those conversations, it’s very likely you’ll find your next blog post idea. Take advantage of discussions and share that information with your blog readers. Diana Urban of HubSpot watched the popular #TwitterTip hashtag where people talk about best practices for Twitter. She used those ideas to create a blog post with a series of Twitter Tips. Don’t stop at Twitter. Go to each of your different social media channels and see what you can find—both on your own accounts and on others’. Interesting conversations are everywhere! Each conversation has the potential to give you an idea for a new blog post and provides a ready-made resource for opinions. 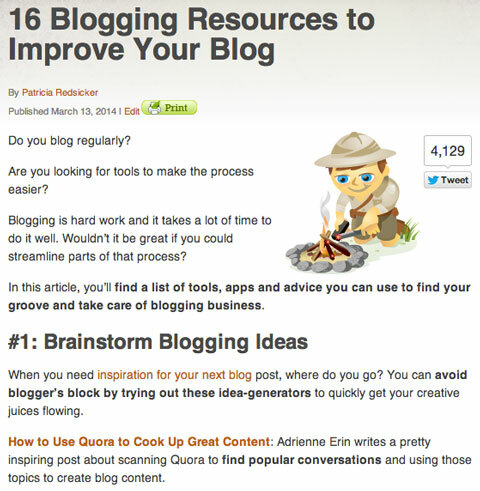 If you’re looking for a blog post topic, try writing an article that answers common questions. Social media is a quick, easy way to find those questions. People naturally go to Twitter, Facebook, LinkedIn or another social network to seek advice because they can usually get answers from someone pretty quickly. Watch for those questions. What questions are your fans and followers asking you or others? Which of those questions seem to come up over and over? Which ones fall under your expertise? Answer them in a blog post—or better yet, answer them in a series of blog posts! 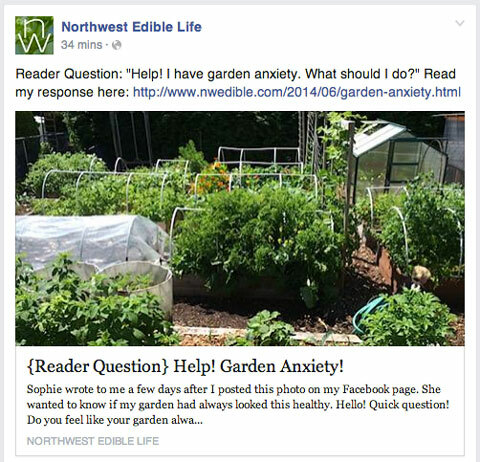 Answering your readers’ questions is a great way to find fodder for your blog. Whether your audience wants to know more about your product, business or industry best practices, you can use those questions to your advantage by writing a blog post to answer them. You’ll have the added benefit of becoming a trusted resource. Social media provides a great way to discover connections that can go from a social media relationship to a business partnership. Sharing updates and interacting with your social media audiences create connections with them—you get to know them pretty well. You see what they are talking about, what their interests are and maybe even the content they create. Ask your audience members if anyone is interested in writing a guest blog post for you. Or if you prefer, reach out individually to people you have targeted as great writers and ask them to write for you. Shay is a blogger at two-tiny-terrors, a parenting blog that highlights what it is like to raise two children. She regularly creates content, but has also asked her social networks if anyone would be interested in guest blogging. It isn’t easy maintaining a blog by yourself. Social media provides a means to find new writers who share similar interests to yours and will likely have fresh topic ideas. People like lists. They’re easy to read (or skim) and they almost always introduce at least one new concept to the reader. Lists are particularly useful for highlighting the symbiotic relationship of your social media profiles and your blog. Lists offer so many options. 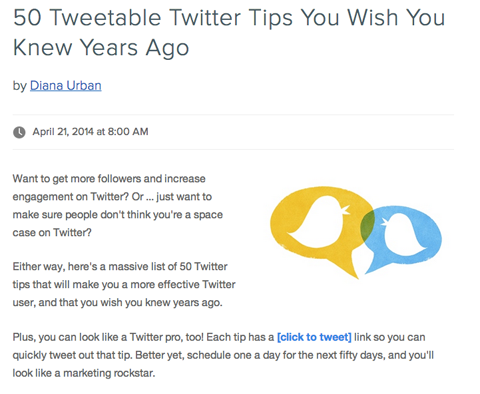 Ask your fans and followers across social channels to help you make a list. For example, you can post “Happiness is …” and ask everyone to leave a comment or tweet back with an answer. List posts like this one make it easy to write about a topic on your blog. Then you can use those answers to create a new list post for your blog (with credit back to your contributors, of course). You could even make this a fun weekly event! To turn the tables, create a blog post with an original Top 10 list. Include a shareable, pinnable image that lures people back to your site. Share your new article on all of your social channels, but only include a few items from your list. Invite readers to visit your blog to read the rest. When you need ideas for your next blog post, consider how you can use social media to empower your blog and vice versa. Using social media and your blog to support each other gives you more bang for your buck and benefits your work and your followers. What do you think? How do you use social media to find blog post ideas? What has worked for you in the past? Please leave your questions and comments in the box below.